Schafer Heating & Air Conditioning was founded by Louis Schafer in Westphalia in 1947, following World War II. For many years, Louis served the heating and later air conditioning needs of the community, with his sons working alongside him. In 1969, his son Pete purchased the business; Louis continued working until his retirement in 1976. During these years, Louis’s sons Mike and Pat also played a vital role in the business operations. 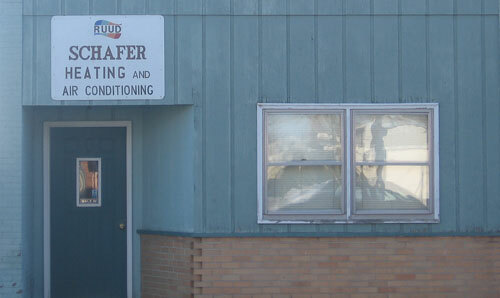 During the 1970’s, Schafer Heating & Air Conditioning was relocated to Pewamo. Originally housed in the “old post office” behind the fire station, it later moved to its current site at 110 N. State Street. It was in 1981 that Pete left the business and the current owners, Pat and Mike Schafer, assumed ownership. Heating and cooling needs have drastically changed over the years, and the Schafer’s have grown to meet these changes for over 60 years. Many do not realize that much of the sheet metal work is done in their on-site shop and is tailored specifically for each individual job. A reputation for prompt service and attention to quality has resulted in the Schafer Heating & Air Conditioning business being highly sought after in the local community and beyond. Installation of new systems and the servicing of existing ones keep Mike and Pat and their employees very busy. The business takes its residential and light commercial work very seriously, and this does not go unnoticed. It is not uncommon for the business to receive a thank-you letter following a job, complimenting the employees on the quality of work done.